The amount of pre-produced material in orienteering broadcasts varies significantly. 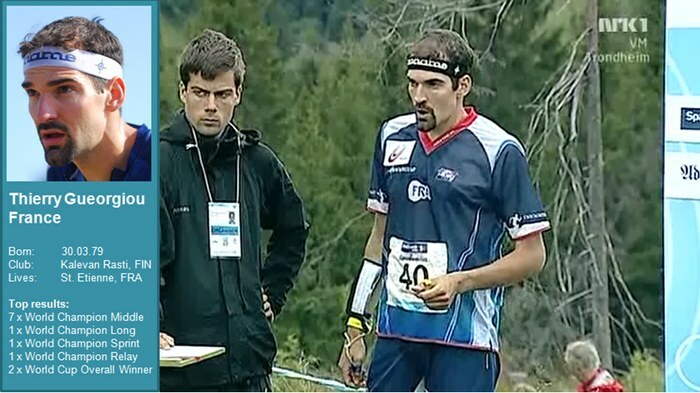 The WOC 2008 broadcasts used a wide range of different categories of pre-produced material, whereas this was used to a lesser extent in other orienteering broadcasts like e.g. the WOC 2010 broadcast. Footage-based course preview PointOfView (POV) footage - i.e. HeadCam footage, Steadicam footage etc. Note! Pre-produced material is also partly linked to Novel technologies. Overall agreement that we do not use enough pre-produced material in today’s TV broadcasts from orienteering races. Overall agreement that we should standarize a run-up for orienteering TV broadcasts - use “copy-paste” from cross-country skiing and do some special adaptions for orienteering In addition to a run-up, there should also be a clearly defined closing sequence. The run-up should always include a course preview (2D or 3D). There seemed to be an agreement that 3D is better than 2D for the course preview. Note that it is important to show the TV split positions clearly in the course overview. For route choice comparison, it was concluded that it is often best to use a 2D route choice comparison, but in some cases where height variations is important you can use 3D route choice comparison. A broadcast should always include PoV-material and route choice comparison/preview for challenging legs / legs to be followed by GPS (but not as part of the run-up but rather as part of the competition sequence). For PoV material, it was concluded that PoV-material should always be coupled to map/GPS position (if somebody is available to do the work). For PoV material, there was not general agreement if one should prefer stabilized material or unstabilized material. Some of the people present would prefer stabilized (“better quality”), som unstabilzed (“show the fight”). Should be decided on a case-to-case basis. PoV material can combine two cases ; first-person view and run behind another runner. The possibility to combine a 3D course preview with PoV footage (stop at the control, show PoV footage) was discussed, but it was concluded that this was not a good idea. Separate the two from each other. Thoughts on the opening sequence based on the output from the SOFT TV Workshop in February 2012. Route choice discussions should be deferred to the competition sequence. PoV material can be used to a limited extent in the opening sequency to give a feeling of the terrain, but main use of PoV material should be in the competition sequence. One idea which was quite popular among many of the workshop participants was to use the first part of the competition sequence to show PoV material etc. from each TV split when the first athletes arrive there. Note: Course preview comes with written information to the commentators. Focus on the challenges in this terrain. ”E.g. The climb in this course is as much as 3x the Eiffel tower”. Map-based course previews are used in many TV-productions from orienteering races (but not all). They range from a simple 2D view of the course "seen from above" to 3D flyovers. In some cases the preview is just to let the viewers get an overview over what the runners meet - in other cases it is attempted to let the viewer understand the challenges the runners face and the choices they must take. Many orienteering TV productions have had very quick course / leg previews - too quick to let an average viewer understand the choices involved for the athletes. Also, course previews are usually only shown once at the start of the broadcast, whereas showing a preview (at least a preview of decisive legs) later on might give additional useful information for the viewer. Below examples of different map-based course previews are included. Several different 3D overfly solutions have been used. Here are some of them. Note that when Google Earth is used as basis as here, the producer might need a license for Google Pro. Google Earth preview in WOC 2008 / WOC 2009 / World Cup Liberec 2011. The below sample is from Liberec 2011. 3DRerun. Used in Big-screen project Norway and WOC 2010 Big-Screen. This example is made to illustrate a leg from WOC 2011 Long (not used in the actual production). Map-based course preview can also be combined with footage-based course preview, see Point-of-view footage synced with GPS-position. Footage-based course preview gives the viewer a sense of what the runner meets in the forest/terrain. Combine it with a map to get improved quality for the viewer. Used e.g. in WOC 2008 broadcast and WC 2011 Liberec. Typically shot as either "point-of-view" footage which shows what a runner sees, showing a runner from behind, or a combination of both. Shutter speed is varying automatically by light amount. But sensor readout speed is relative to frame rate and therefore 720p50 (720p60 for NTSC) mode is clearly the best option. There sensor readout is adequate and rolling shutter and jello effect is minimized. With this mode and careful camera setup for running cameraman (tightly secured camera and cameraman focusing only for camera operating), footage could be used straight from the camera. Mounting the camera on head (tight) is a natural option while head is stabilinzg rather well if cameraman itself is not doing orienteering moves. Also mounting on solid vest can give good results and shooting direction to front and back could be used. Traditional night lamp battery west with extended battery weight is one option. If there is enough preparation time, stabilation could be used. But stabilation brings other artefacts like reduced resolution and poorly handled rolling shutter correction (differences between stabilazing methods exist). In Hero2 there is a better sensor (and readout speed) but still 50p mode gives better results (even when going for lower temporal resolution like 50i or 25p). For Hero2 Field Of View can be set separately on resolution mode and it can be selected on case by case basis. HeadCam through WOC Sprint Final 2011 just ahead of the start. No stabilizing applied. Used e.g. in NORT final 2011. Not used in any major TV broadcasts from orienteering races yet. Offered to the producer of WOC 2011. Clip for WOC 2011 Relay terrain made ahead of the race shown below. Currently runner presentations are seldom used in orienteering broadcasts (note that the base material is not readily available from IOF like it is e.g. from FIS). Graphics showing picture, name, birthdate, nationality, best results etc. for the runners should be available to show when required. This is an important part of building profiles in the orienteering sport to make the product better accessible to a broader audience. Typically used in national version of productions only? E.g. WOC 2010 Trondheim by NRK. This page was last modified on 29 March 2012, at 23:53.